The UN investigative panel was mandated to conduct investigation during the period of the LLRC. That was between 2002 and 2009. The UNHRC has given itself an additional two years. With the LTTE designated as a foreign terrorist organization and following Sri Lanka proscribing 16 LTTE fronts and declaring 424 individuals incorporating the UNSC Resolution 1373 as supporting LTTE terrorists and with the UN Security Council Counter Terrorism Committee head in Colombo, the UNHRC cannot omit from investigation and comment in its March 2015 report the links between LTTE and the Tamil National Alliance and the LTTE Tamil Diaspora now banned. An unregistered alliance of Tamil political parties formed on 22 October 2001 before the Norwegian backed cease fire agreement of 2002 and immediately after the 9/11 attacks and the war on terror. The TNA was signed by 4: TULF represented by R Sambathan, ACTC represented by N Kumarakuruparan, TELO represented by N Srikantha and EPRLF represented by Suresh Premachandran. It was after the 10th Oct 2000 Parliamentary elections that LTTE realized that it was losing its grip in both the North and East where its people were not getting represented. Even Sambanthan was not elected in Trincomalee. It was former “Daily Mirror” columnist Dharmalingam Sivaram alias Taraki who gathered interested parties and promoted the need to unite under an umbrella organization to prevent votes splitting. 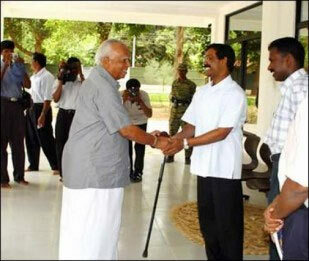 What is important is that Taraki (Sivaram) suggested that the new organization must be supportive of the LTTE. TNA-LTTE rigged votes in the 2004 elections – the 2002 ceasefire allowed LTTE to manoeuvre itself islandwide and set up TNA offices that ‘employed’ LTTE cadres to do propaganda work for the TNA which in reality was promoting LTTE agenda. TNA took oaths in front of Prabakaran despite taking oath to safeguard the territorial integrity and sovereignty of Sri Lanka as per Sri Lanka’s Constitution. 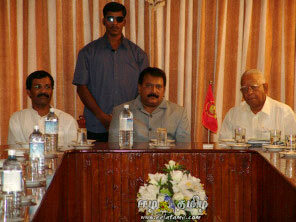 The TNA was meant to be the political face of the armed LTTE giving them international acceptance. It was the LTTE who chose candidates for the General Election of 2004 – LTTE even fielded its nominees under the parties that constituted the TNA. When TNA won 22 seats the TNA winners were all summoned to Wanni and given strict orders by the LTTE and Sambanthan was selected as the TNA Parliamentary group leader. It was because of the rigging that TNA got 8 out of 9 seats. It was because LTTE rigged the polls that Selva.Gajendran, Pathmini Sithamparanathan, Gajendrakumar Ponnambalam,Suresh Premachandran, Nadarajah Raviraj, Somasundaram Senathirajah, Sinnaiah Sivanesan and MK Sivajilingam won parliamentary seats – investigate. It was because LTTE helped rig the polls that Sambandan and Thurairatnasingham got elected from Trincomalee – investigate if false. TNA members involved in LTTE propaganda work on the pretext of fund raising for the well being of Tamils in the North and East. TNA MPs have abused their Parliamentary privileges to transport LTTE cadres and thus escape checking by security forces. TNA MPs are seen with pro-LTTE group leaders all of whom have been proscribed by the GOSL – guilty by association is a legally accepted norm. 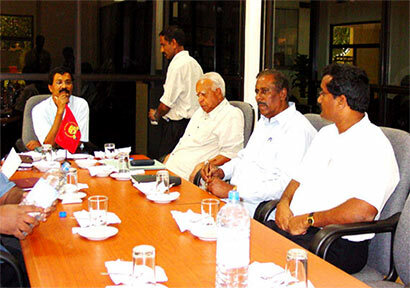 TNA MPs have been called to attend meetings headed by LTTE leaders in the Wanni pre-2009 and covering the UN investigation period thus the UN investigators are bound to look into not only the ties between the LTTE-TNA but how far the LTTE ruled over the TNA. This would establish that TNA and LTTE are one and the same and the TNA was formed primarily to carry on the LTTE goals and objectives politically. LTTE & TNA demands are virtually one and the same – refer the manifestos / refer TNA speeches in Tamil / and most importantly at NO TIME throughout LTTE reign of terror has any TNA member condemned LTTE atrocities publicly. At no time has the TNA appealed for the LTTE to release civilians that LTTE kept as human shields/hostages. At no point in time did TNA give a single packet of rice to poor Tamils to claim concern for them. 2001 TNA election manifesto declared LTTE as the ‘sole Tamil national entity’ and the ‘sole representative of the Tamil people’ and that LTTE had the right to negotiate on behalf of the Tamil people. A letter by Anandasangaree to the Indian Prime Minister dated 2 October 2014 declares that LTTE made use of S. Senathirajah, the President of the ITAK ,to strengthen their position. Anandasangaree also accuses Senathirajah of unfairly reviving ITAK “”TULF MP Mavai Senathirajah who is in the process of reviving the Federal Party visited Killinochchi and had meetings with the LTTE Deputy Political Commissar Thangan on 14-10-2003. 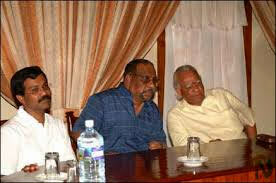 The revival of the Federal Party is being undertaken at the behest of the LTTE”. Anandasangaree translates that declaration thus “:-“Accepting the leadership of the LTTE as the National Leadership of the Tamil people and also accepting the LTTE as the real sole – representatives of the Tamil people, we honestly and firmly pledge to give our full support for the struggle the LTTE had undertaken on behalf of the Tamil Nation”. 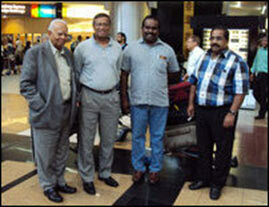 TNA holds meeting with Global Tamil Forum head Father Emmanuel in South Africa on 8th January 2012. Global Tamil Forum is proscribed by GOSL and its head is also declared a LTTE supporter under UNSC Resolution 1373. Both TNA and GTF were invited by the African National Congress to its Centenary Celebrations. TNA MP Sumanthiran gave BBC a statement “We are trying for a political solution that recognises Tamils as a nation and South Africa’s help will be vital for both the TNA and the government in achieving that”. The European INGO that funded the TNA visit to South Africa needs to be investigated. TNA MP Sridharan’s brother migrated to Switzerland and is running anti-SL websites promoting LTTE ideology. The two sites are very popular among Tamil Diaspora. TNA MP Sridharan has links with Nediyavan, Rudrakumaran, and Vinayagam – all named and banned by the GOSL in order to raise financial support and Reggie has sent money to MP Sridharan to look after Mahaveer families, LTTE disabled cadres and to start orphanages in the North. These actions are a direct threat to the national security of Sri Lanka. In the words of veteran political commentator DBS Jeyraj adequately sums up the TNA-LTTE links. Sadly this sorry tale of the TNA toeing the tiger line continues even after the fall of the tigers.The TNA is unable to break away from its pro-tiger past and is generally adopting the extremist line propagated by LTTE and pro-LTTE elements in the global Tamil Diaspora. The perception that the TNA is aligned to the LTTE is one that seems to gaining ground mainly due to the party’s woeful conduct in the post – May 2009 phase. One way of shedding this image is for the TNA to assert itself independently by boldly exposing the human rights violations of the LTTE before the UN panel probing the seven year period between 2002 – 2009. Since the TNA –LTTE Nexus prevailed throughout the seven yer period under review the TNA should have no difficulty in doing this. The question at this critical juncture is “Will the TNA do so”? Thus not only is the Government of Sri Lanka bound to investigate TNA ties to LTTE and LTTE Tamil Diaspora but the UNHRC Investigation needs to in the light of its mandate period investigate the links as well. If the previous elections had been rigged that brought TNA initially to Parliament, do we not have every reason to suspect mischief at play in every election that TNA has won? If so, should both the GOSL and UNHRC not insist that an investigation be launched into TNA to establish once and for all if TNA continues to have ties to the LTTE and the LTTE Tamil Diaspora which is very much active. The SL Govt. now must proscribe the TNA as she did for 16 LTTE fronts and declare TNA as LTTE front, ban it from being a political party and prohibit TNA from standing for any elections. UN is just another catspaw of USA, who has appointed itself arrogantly as the world’s leader, to dictate terms to smaller nations like SL. so that these nations are at US beck-and-call to be stripped of their national resources. UN is therefore doing the bidding of its master USA, to punish SL for not heeding its order not to destroy the LTTE terrorist group. Hence, all these trumpped-up charges against SL President, Defence Sec and Military leaders of war crimes, crimes against humanity and human rights abuse. No matter how ever much we rail against this injustice, UN and its minions will ignore our outraged cries and heed its master’s voice (USA) to destroy SL current leadership to be replaced with a leadership docile and enslaved to USA and the imperial West.